Welcome back to Learn All About Horses. Summer is almost over. Our kids start back to school in three weeks. I can hardly believe it! This edition introduces the Tarpan, a reincarnated breed of horses, plus directs you to a website full of information on different horse breeds. I have also left in the article on the West Nile Virus because knowledge and prevention of this disease is so very crucial to preventing its spread. The Department of Animal Science at Oklahoma State University sponsors a Breeds of Livestock website that is chock full of information on different breeds of horses, cattle, sheep, goats, swine, and poultry. I have found this website to be very informative and extremely useful in research and for satifying my insatiable curiosity. I am postive you will find it equally helpful and enjoyable. Do you want to work at home? Need a second income? or a third? Don't want to inventory, stock, or deliver products or sell door-to-door? Check out the MOM Team. Note: This is not a get-rich-quick scheme or a scam. This is a no risk opportunity to develop a profitable business while creating a healthier home. 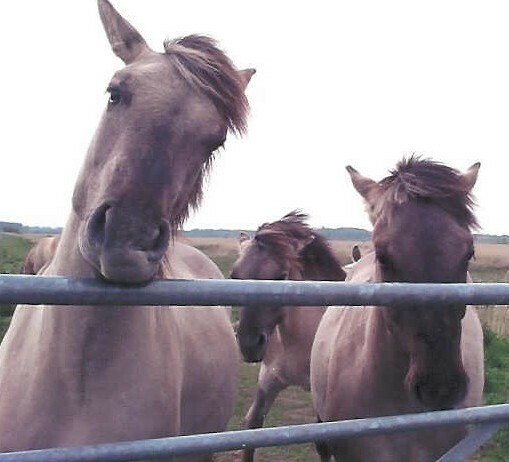 These horses I saw on a nature reserve in Minsmere, Suffolk. They are beautiful, wild and majestic. Despite being untamed, you can see the characteristics coming through. Especially, the one nibbling on the fence and the filly playing in the background. Since receiving this picture from Vanessa, I have learned that the modern Tarpan horse is a genetic recreation of the original wild Tarpan horse that died out in the late 1800's. To read more about this facinating breed and its reincarnation click the Tarpan Horse connection below. At the Oklahoma State Univerisity Breeds of Horses website, click T, then Tarpan.